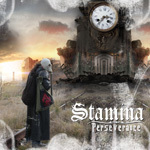 Coming as a surprise, and one of the better releases from Power Prog Records in recent months, is the third album from Italy's Stamina, Perseverance. The surprise comes from Stamina's ability offer some rather genre bending and crossing music. Stamina: they may need it. It's not that the music is eclectic or odd, simply a good mix classic hard rock with heavy metal, bits of fusion and jazz, in a obvious progressive wrapper. Sometimes the musical texture is more defined, clear as it were. For instance, the title track moves as swift melodic rocker with distinct metal edge. Alternatively, Just Before Dawn develops into more epic symphonic metal, with loose prog nuances and, at the end, finishes with a most delicate and moving orchestral conclusion accented by piano and acoustic guitar. Then there's Breaking Another String offering something more akin to progressive power metal, again with some symphonic notes throughout, and a clever fusion breakdown just before four minutes accenting both the bass and guitar line. Naked Eye returns the band to more melodic hard rock, albeit a bit heavier, and once more with some jazz rock groove around the half way point, and thrilling lead guitar to wrap things up. It's like some hybrid AOR melodic rock fusion. After this, Unbreakable finds the band traversing the path of more straight heavy metal, with few nuances. Ultimately, what Perseverance is, is music worth listening to, simply because Stamina writes and plays some creative and interesting music, which keeps your interest and so, keeps you listening. Quite recommended. What Perseverance is, is music worth listening to, simply because Stamina writes and plays some creative and interesting music, which keeps your interest and so, keeps you listening.